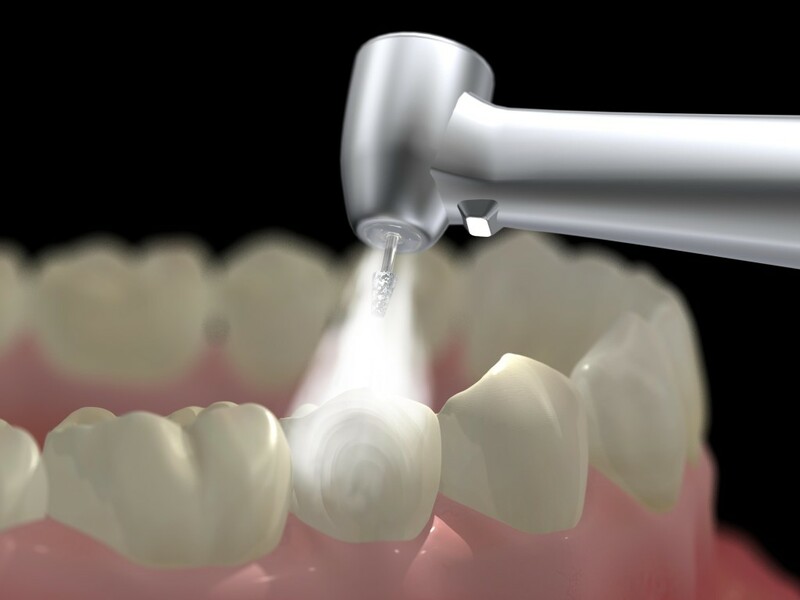 First, the dentist will use a local anesthetic to numb the area around the tooth to be filled. Next, a drill, air abrasion instrument, or laser will be used to remove the decayed area. The choice of instrument depends on the individual dentist's comfort level, training, and investment in the particular piece of equipment as well as location and extent of the decay. Next, your dentist will probe or test the area to determine if all the decay has been removed. Once the decay has been removed, the dentist will prepare the space for the filling by cleaning the cavity of bacteria and debris. If the decay is near the root, your dentist may first put in a liner made of glass monomer, composite resin, or other material to protect the nerve. Generally, after the filling is in, your dentist will finish and polish it. Several additional steps are required for tooth-colored fillings and are as follows. After your dentist has removed the decay and cleaned the area, the tooth-colored material is applied in layers. Next, a special light that "cures" or hardens each layer is applied. When the multi-layering process is completed, the dentist will shape the composite material to the desired result, trim off any excess material, and polish the final restoration. Temporary fillings are just that; they are not meant to last. They usually fall out, fracture, or wear out within a month. Be sure to contact your dentist to have a temporary filling replaced with a permanent one. If you don't, the tooth could become infected or you could have other complications. How Should I Care for My Teeth With Fillings? To maintain fillings, you should follow good oral hygiene -- visiting your dentist regularly for cleanings, brushing with a fluoride toothpaste, flossing and using an antibacterial mouthwash at least once daily. If your dentist suspects that a filling might be cracked or is "leaking" (when the sides of the filling don't fit tightly against the tooth, this allows debris and saliva to seep down between the filling and the tooth, which can lead to decay), he or she will take X-rays to assess the situation. If your tooth is extremely sensitive, if you feel a sharp edge, if you notice a crack in the filling, or if a piece of the filling is missing, call your dentist for an appointment.